LIMITED TICKETS AT THE DOOR TONIGHT! YOU BE THE JUDGE. 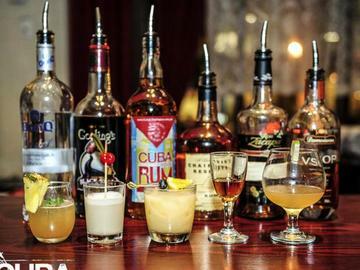 WHICH OF DC'S TOP MIXOLOGISTS MAKE THE BEST RUM DRINKS? The Cocktail Nation™ will host an evening of exciting new rum cocktails, live entertainment by Latin band QUIMBAO, delicious fare by CUBA LIBRE Restaurant & Rum Bar and friendly competition among some of the DC area’s most talented mixologists and rising stars . Each mixologist will be asked to create a cocktail using one specific type of rum from the following categories: white, añejo, spiced, flavored, 100% sugar cane, and dark. The resulting concoctions will be judged by an expert panel and event attendees will have a chance to cast a popular vote after tasting each of the competing cocktails. The winners will be awarded cash prizes, a feature article in the national publication in the Mix and recognition in NIGHTCLUB & BAR, a trophy or certificate, and bragging rights as an award-winning mixologists in the competitive DC area. Proceeds from the event will benefit CORE (Children of Restaurant Employees), a national 501(c)3 charity whose mission is to support the children of food and beverage employees who are navigating life-altering circumstances or conditions. For more information, or to nominate someone in need, please visit http://www.coregives.org/. Admission includes: Samples of competing cocktails, food and non-alcoholic beverages provided by Cuba Libre Restaurant & Rum Bar and a chance to vote for the crowd favorite. Some signature menu items served will be Mama Amelia's Empanadas, Arroz con Pollo, Spinach and Manchego Bunuelos and Octopus a La Parilla. Must be 21+ years old to participate with valid ID.